The Cubby is an area where you can drag any number of entries to be stored and then move them to a different day, a different week or an entirely different planbook. Like normal dragging, the Cubby supports moving and copying. You can move single plans to the Cubby or an entire day's plans. To move a single plan, click the green crosshairs in the lesson box. To move an entire day, click the green crosshairs next to the day of the week. On the left you will see a box slide into view. This is the Cubby. Drag your item there and release. 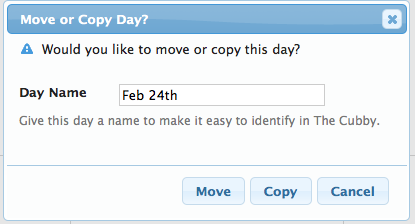 You will be presented with the same Copy or Move option that appears when moving a period within the week. 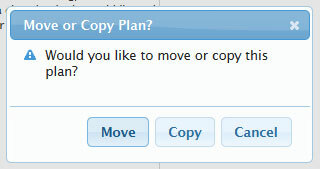 If you select "Move", the entry will be removed from your planbook and appear in the Cubby. If you select "Copy", the entry will be left in your planbook as well as appearing in the Cubby. You can drag as many entries to the Cubby as you'd like. 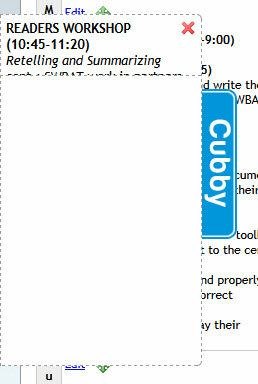 You can open and close the Cubby by clicking the blue tab. 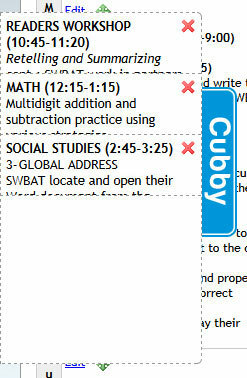 If you have nothing stored in the Cubby the tab will not appear. You can remove entries from the Cubby by clicking the red "X". Cubby entries are stored indefinitely. You can log out or even switch computers and they'll remain.